Check it out!This Saturday we have been invited to Masterton Motorplex International Dragstrip for the Rapanats Burnout Competition, what better way to spend your long weekend with some WICKED Burnouts! Gates open at 9, Skids start at 10! Check out the latest issue of New Zealand Petrolhead for excellent coverage of the 51st NZ Nationals and the final round of the Kiwi Thunder Group One National Series! Kyle Lampp show this to your mum. Congratulations to Barry Plumpton (Top Doorslammer) and Anthony Marsh (Top Alcohol) for their respective wins in the KIWI THUNDER GROUP ONE NATIONAL SERIES! Click on the link for full details. Yes" great photos" thank's for shearing" massive to see" NZ drags while living in Brisbane.. The official results for the 51st NZ Nationals and final round of the Kiwi Thunder Group One National Series are now up on our website! Find road closures, incidents, roadworks and traffic cameras across New Zealand. Peter Meo Jo Meo just in case word hasn't got to you. 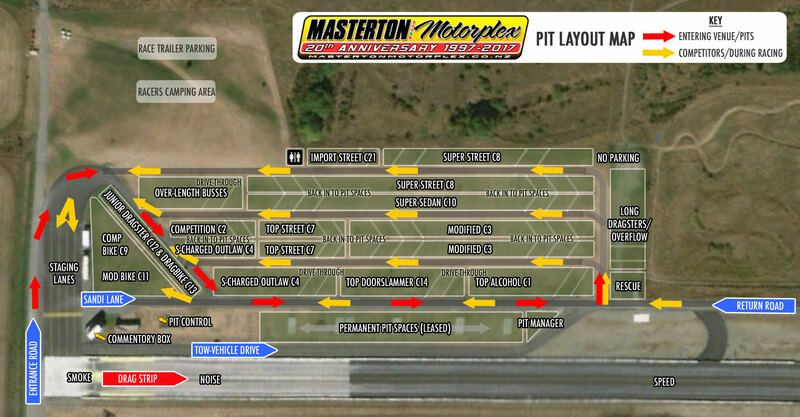 Masterton Motorplex International Dragstrip is at Masterton Motorplex International Dragstrip. DAY TWO - RACE DAY! After an action packed day yesterday with plenty of thrills and spills, we’re ready for another day of drag racing! As a bonus, as well as 190 vehicles racing, there will be a procession and display of Henry Ford’s finest with the ‘Deuce Days’ event calling in to the Motorplex from around 10am. Big thanks to Alan Paterson for these great images! See you at the track! Any chance of a live stream ? So us aussies can watch?? WE NEED YOUR OLD TYRES! To enable us to prepare our track surface for racing, we need any unneeded or worn 'racing' compound drag racing tyres. Any tyres will be gratefully accepted and pick-up can usually be arranged if necessary. Contact Bob on 0274 494 995.